Me and my wife (Margareth Orlandi Boaventura) were on vacation on Easter Island. We stayed at Hotel Victoria in Hanga Roa. On March 14, 2018, we returned to the hotel and I saw a silver object entering the cloud and I warned my wife. Then my wife saw another object farther on and also disappeared into the cloud. I was able to get only one photo of the unidentified flying object at 5:23 p.m. on March 14, 2018. In the last few days we saw bright strange lights at night that were not airplanes, stars, balloons, or drones. It was strange. On the 14th we saw by day the two silver objects that reflected the light of the Sun. We would like an analysis in the photograph. 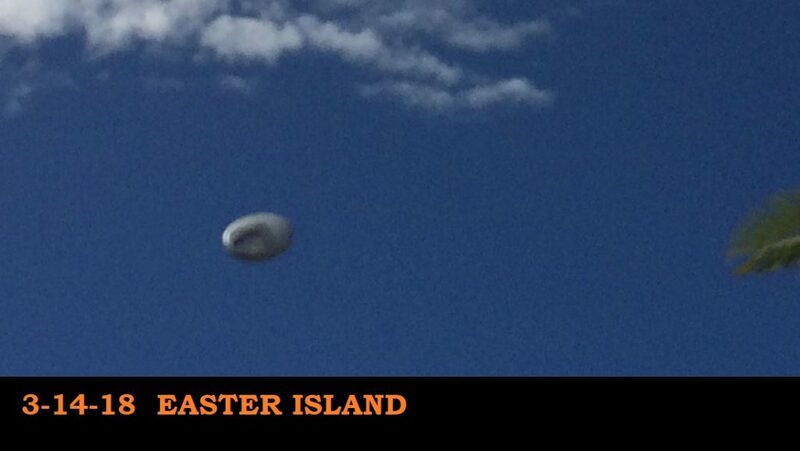 This entry was posted in ABDUCTION, best ufo photos, MISSING TIME, UFO, UFO ARTICLES, ufo news, ufo photos, Uncategorized and tagged 2018 EASTER ISLAND UFO PHOTO, 3-14-18 EASTER ISLAND UFO PHOTO, ABDUCTION, ALIEN CRAFT, ALIEN CRAFT LANDING, ALIEN CRAFT PHOTO, ALIEN ENTITY, ALIEN IMAGE, ALIEN IMPLANTS, ALIEN PHOTO, ALIEN PICTURE, AMAZING UFO PHOTO, BEST UFO PHOTO, best ufo photos, CAMERA CAPTURE UFO, CIRCLE LIGHTS UFO, close encounter, CLOSE ENCOUNTER UFO PHOTO, DISC, EASTER ISLAND UFO PHOTO, FLYING SAUCER, HIGH STRANGENESS, incredible ufo photos, KEN PFEIFER MARS DISCOVERIES, KEN PFEIFER UFOLOGIST, light photo, MARCH 14, MISSING TIME, saucer, top ufo news, ufo, UFO ARTICLES, UFO LANDINGS, ufo news, ufo photos, UFO PICTURES. UFO IMAGES by KEN PFEIFER. Bookmark the permalink.